David George Gordon’s Uncover a Horse transported me back to the days of 4-H hippology competitions. 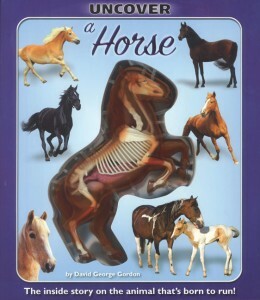 This book is perfect for budding equine enthusiasts who want to know about horses’ anatomy or behavior. Page by page, readers physically deconstruct and reconstruct a horse. While the book does not speak to animal welfare issues, it does explain what horses are all about and what they need, making it a good primer for kids lucky enough to have a real horse in their lives. Riding and driving horses are not the focus of the book, but they are dealt with in a straightforward manner. As someone who had horses as childhood companions, Uncover a Horse reminds me how magical, and complex, these animals are. Kids intrigued by dolphins, sharks, or tarantulas will be delighted to learn that Mr. Gordon has penned similar “Uncover” books about those species.